There's no denying that the United Nations climate conference, COP21, charts a new course of direction for the world economy. The outcome was a global deal - struck between a record breaking 195 nations - that determines greenhouse gas (GHG) emissions will be drastically reduced. Market forces will be required to work together to achieve the goal. Policymakers must introduce the mechanisms that will foster low carbon growth; businesses must fulfil the commitments they made in the run up to Paris; and investors and financial bodies must manage climate risks as a fiduciary duty. To this latter objective, the Financial Stability Board has announced a new Task Force on Climate-related Financial Disclosures, which has placed a renewed emphasis on corporations reporting their climate information. A move no doubt welcomed by the investors that use climate data disclosed by 5,500+ of the world's largest companies through CDP in order to understand and act on climate related risk. Now, newly released evidence based on the climate disclosures from more than 4,000+ suppliers provides further support for the focus of the task force; quite simply, it shows that disclosure works. From Disclosure to Action, is the latest annual update of how some of the world's biggest brands are working to achieve sustainable supply chains. It is the largest ever study of climate data from suppliers and 75 of their corporate customers, who include The Coca-Cola Group, General Motors, Goldman Sachs, and Walmart. With supply chains responsible for up to four times the GHGs of a company's direct operations, these leading organizations are aware that supply chains house both sizable regulatory risk and ample opportunity for businesses to lower emissions. To prepare for the inevitable low-carbon transition, as determined by the international climate deal, these progressive organizations use CDP's global platform to seek disclosure from thousands of their key suppliers on carbon emissions and climate risk. The information is fed back to the purchasing teams, enabling them to make the right business decisions. Further, it is synthesized into a global report, enabling others to adopt leading practice and build climate resilient businesses. This year we see clear evidence that the risk management and climate performance of disclosing suppliers improves with time. Around three quarters of the suppliers that have been reporting through CDP for at least the past three years have climate risk management procedures in place and are actively reducing emissions. Fewer than half the first time participants can claim these advantages, demonstrating that measurement and disclosure lead to better management. Regular disclosers are also better at realizing financial benefits. Repeat participants achieve an average of US$1.5 million in annual savings for each carbon cutting project, compared to first time disclosers, who save US$900,000 per initiative on average. Separately, in a study from a Hermes Investment Management affiliate a correlation between climate reporting, reduced risk and lower cost of debt is established. 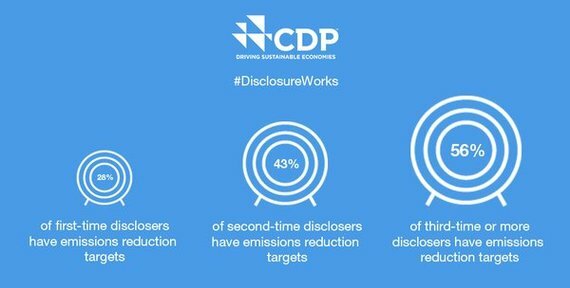 It finds that, on average, firms save interest costs to the amount of US$1.2 million per annum when they start to disclose their carbon emissions through CDP. In this way, the 75 member companies of our supply chain program and the 822 investor signatories of our climate change program are implementing scalable solutions that drive disclosure, which leads to action. These forward-thinking organizations could be the blueprint for turning the Paris climate agreement into action that creates stronger economies.